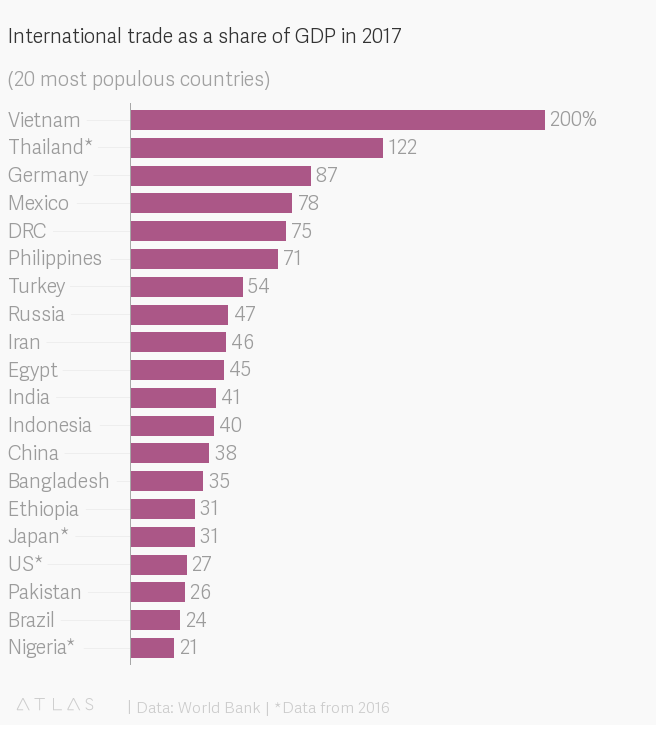 In 2017, Vietnam’s trade as a percentage of GDP reached over 200%. The measure is calculated by adding the value of exports and imports then dividing the figure by GDP. Countries with high measures are typically rich and small. Hong Kong, Singapore and Luxembourg all have rates over 300%. Companies in these countries make products for export because the domestic market is too small consume all of their output. As a large, poor country, Vietnam is an outlier. Vietnam’s exceptionally globalized economy is a result of its focus on exports for economic growth. Like China before it, communist-run Vietnam has opened up its cheap labor market to foreign investors and become a hub for low-cost manufacturing. The country is now a major exporter of electronics and apparel, with the United States and China as the main destinations for its goods. In order to make those goods, Vietnam is a major importer of machine parts and natural resources from South Korea and China. Globalization been good for Vietnam. It’s GDP per person grew from about $1,500 in 1990 to about $6,500 today. Unlike in some fast growing economies, its new prosperity has been shared. The proportion of people in extreme poverty fell from above 70% in the early 1990s to around 10% in 2016. The World Bank credited the jobs created by Vietnam’s export sector for this remarkable poverty reduction, in a recent report. The Vietnamese people have noticed the benefits of globalization. As my former colleague Matt Phillips pointed out, 95% of Vietnamese people said “trade is good” in a 2014 Pew Research Survey. Though globalization has mostly been a boon for Vietnam, having such a globally-integrated economy does carry risk. If the United States or China chooses to close their economy, Vietnam would be in dire straits. Countries of similar wealth, like Nigeria and Philippines, are insulated from the economic whims of global powers because they are more focused on their domestic markets. There are also limits to the Vietnamese desire for globalization. A recent measure by the Vietnamese government to allow foreigners to have 99-year leases on land in special economic zones within the country (paywall) sparked huge protests. The Vietnamese protesters fear that Chinese business interests are gaining too much power in the country.